Simply Stunning! Must Do in Key West! Bliss in the Middle Gulf! National Park a National Treasure! These are just a few ways people are describing their visit to the Dry Tortugas National Park. It’s a place like no other, a hidden gem full of history and beauty. Tour the fort, take photos, snorkel and enjoy a day a day in paradise. The Dry Tortugas is a group of seven small islands located 70 miles west of Key West and are accessible year-round via ferry or seaplane service from Key West. Visitors can explore the unparalleled historical resources and natural beauty of the islands as they tour Fort Jefferson, relax on pristine sandy beaches, snorkel in the clear blue waters and see beautiful tropical sea life, and on any given day there will be thousands of seabirds in the area for naturalists to enjoy. Some of the best snorkeling and skin diving in North America can be found here. The Dry Tortugas have been known for their amazing richness in migrating land birds and vast seabird colonies. The seven tiny islands of the Dry Tortugas are a vital layover for migrating birds traveling between South America and the United States. These are just a few reasons why the Dry Tortugas are a unique Florida Keys Birding spot. Rare finds and a wide variety of bird species come to nest throughout the year. 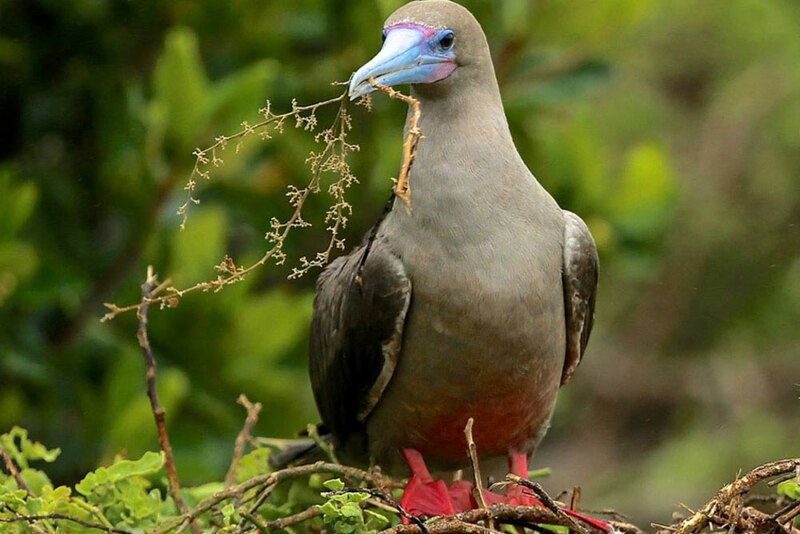 Red-footed Boobies are rare visitors to North America, but when they do make an appearance, they're found around the islands of the Dry Tortugas off of Florida or off the California coast. They were discovered in 1513 by the Spanish explorer Juan Ponce de Leon, who named them the “Tortugas” for all the sea turtles found there. The “Dry” was added later so passing mariners would know that there was no freshwater to be found there. In 1822, the Dry Tortugas became part of the United States. The location of the islands as gatekeepers of the Gulf of Mexico made them strategically advantageous, and in 1846 a large fort began to be built there. Construction of Fort Jefferson, as it was named, continued over the next 30 years. The fort’s wall are 8 feet thick and 45 feet tall. It is made of over 16 million bricks and is the largest masonry structure in the United States. 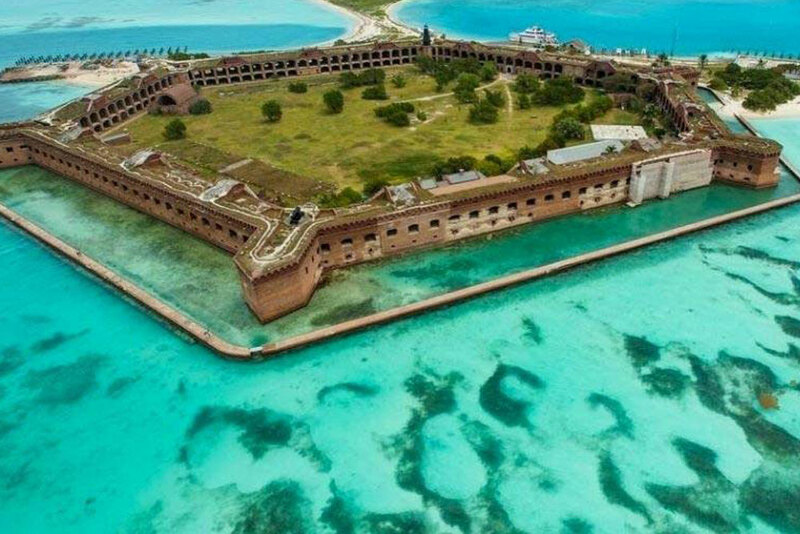 Surprisingly, construction of Fort Jefferson was never officially completed – improved military technologies rendered it obsolete, and the fort was abandoned before it was finished. Fort Jefferson was occupied by Union forces during the Civil War, and it served as an important station in the blockade of Confederate ports. 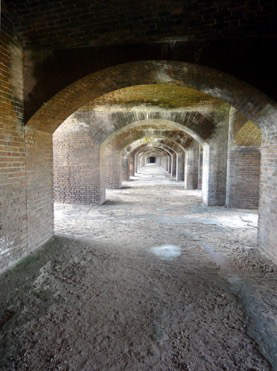 Though there was never any fighting at the Dry Tortugas, many troops became sick and died from mosquito-borne yellow fever while stationed there. The fort also served as a prison during the war and after. The most famous prisoner held there was Dr. Samuel Mudd, who had been convicted for his role in the assassination of Abraham Lincoln. Mudd won an early release for his efforts in combatting yellow fever. For many decades starting in the 1870’s Fort Jefferson stood abandoned, with only a small community living there to maintain the lighthouses. In 1935, President Franklin Roosevelt created the Fort Jefferson national Monument, and in 1992, all the islands and their surrounding waters were designated as Dry Tortugas National Park. Visit Dry Tortugas National Park by Seaplane or Ferry. Journey from Key West to the Dry Tortugas National Park & Fort Jefferson aboard the Yankee Freedom III Ferry! This is a full day excursion. 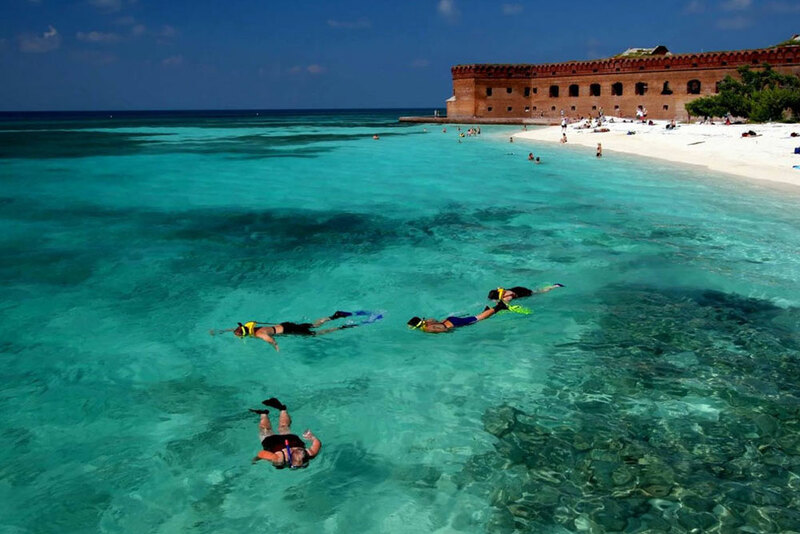 It takes 2 hours and 15 minutes to get there and you have over four hours to tour the fort, snorkel and enjoy the beaches of the Dry Tortugas. Learn more about Yankee Freedom. Key West Seaplane Adventures - Offer half day and full day trips. The only seaplane service to Dry Tortugas National Park. Half day trip just under 4 ½ hours gives you at least 2 ½ hours of island time. Travel time is about 40 minutes each way. Full day trip is just under 8 hours provides you with over 6 ½ hours of exploration. Charter flights are also available. Learn more about Key West Seaplane Adventures.